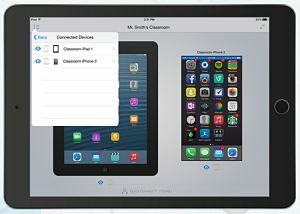 An updated version of an iOS app enables teachers to manage what device will be displayed in front of the classroom. Reflector Director from Squirrels is a companion app to Reflector 2, a wireless screen-mirroring and streaming receiver application that displays mobile device content through Google Cast, Apple AirPlay and Squirrel's own AirParrot 2.
run full-screen mode to prevent showing other content from the computer. Version 2.0.1, the current edition available in the iTunes Store, primarily addressed connection issues and added additional controls for running Reflector Director from a mobile device.